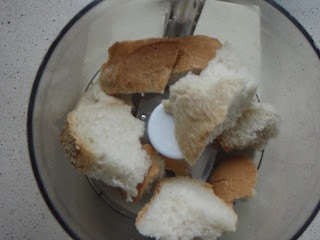 Many of you may have this recipe already because this is also one of my most requested. I like to make this for families with a new baby or when someone isn't feeling well. It makes you feel better!! Take care with the salt when preparing this recipe. 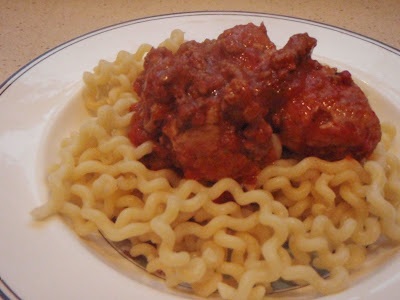 There is salt in the tomatoes and the meatballs so it is not wise to add any more to the sauce during preparation. Wait until everything is completely done --then taste to see if you need any additional salt. Heat 1-2 tablespoons olive oil in large pot over low to med heat. 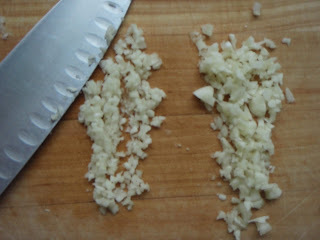 Sauté onion and garlic until soft and slightly golden. 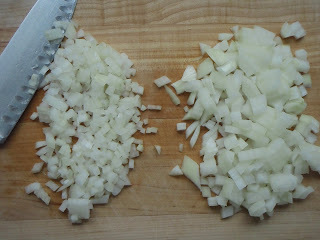 Increase heat to med-high and move onions & garlic to edge of pot. 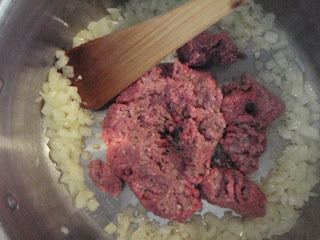 Add ground beef and sauté until all pink is gone. 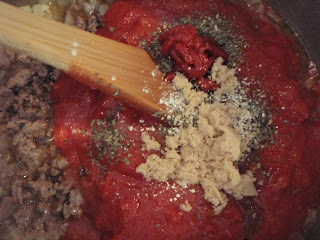 Add crushed tomatoes, tomato paste, herbs & spices, pepper, and brown sugar. Stir to combine and simmer for at least a ½ hour. 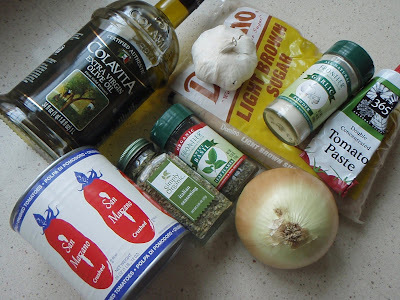 Heat 1-2 tablespoons olive oil in large skillet or sauté pan over medium heat. 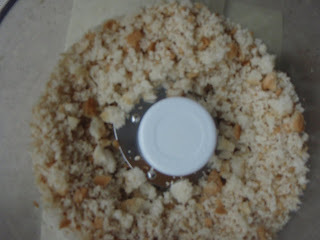 Combine garlic, onion, bread crumbs, water, egg yolks, salt and pepper –mix together with your hands or a fork. 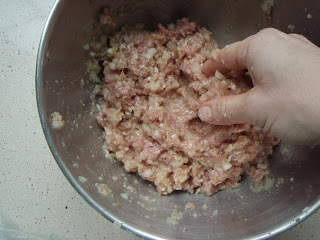 Add the pork and mix with hands to combine. Form mixture into ½ -inch to 1-inch balls. 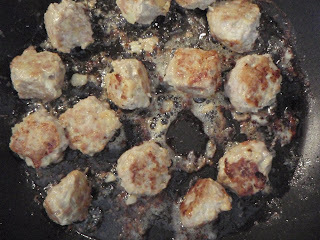 Sauté in hot oil, in batches so that pan is not crowded, on all sides until browned. 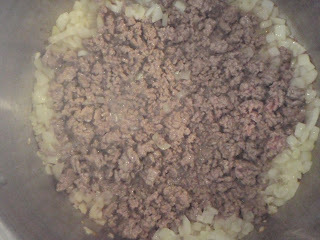 Add to meat sauce as each batch is finished. 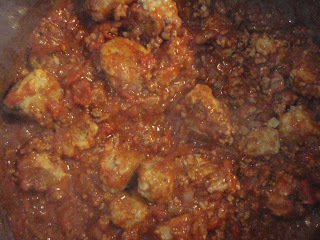 Continue to simmer meatballs in meat sauce for at least 15 minutes more. Don't crowd the pan, please. 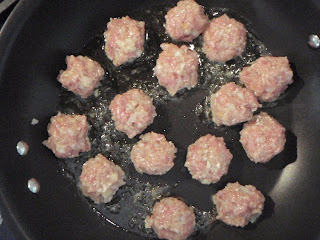 See how I didn't fit all the meatballs into the pan?